A subtle but strong cold front moved through the Finger Lakes Sunday night. Cold, but dry air is moving south on a north wind behind this front and will lead to a chilly start to the week. Temperatures this morning are mostly in the upper 20s across the region. Clouds behind the front are departing and will be replaced with sunny skies from north to south this morning. The sunshine will help offset some coolness of the incoming airmass with highs this afternoon in the mid and upper 30s. Winds will remain gentle with top gusts only around 20 mph. The wind will not dissipate tonight, but skies will remain clear. Temperatures should drop into the low 20s with a few upper teens across the Southern Tier and into Central New York. Tuesday will be very similar to today. Skies will remain almost perfectly clear throughout the day. Winds from the north will gust between 20-25 mph. Temperatures will reach the mid and upper 30s once more. Our temperatures should be in the mid 40s at this time of the year. Tuesday night will be almost exactly like Monday night with most areas at or just above 20 degrees with a few teens showing up. Winds will swing around to the south on Wednesday and temperatures will respond quickly. Aided by another sunny day, high temperatures should push into the low 50s. Some cloud cover will finally work in after midnight Wednesday night. The clouds will help hold temperatures near or above 30 degrees. Scattered showers will work in on Thursday, especially during the afternoon and evening hours. High temperatures Thursday should reach the mid 50s. The weather becomes more interesting Friday into Saturday as a strong front sets up from west to east somewhere in our vicinity. To the north of this front, temperatures will be stuck in the low and mid 40s. To the south, 50s and 60s are likely. As things currently stand, the front may be to our south on Friday, only to lift north for Saturday. Precipitation will be possible both days, but if the front lifts north, the warm air would be accompanied by a period of dry weather as well. Temperatures will probably cool for Sunday and early next week as the front gets swept away by a low pressure system, but early projections keep highs in the 40s. 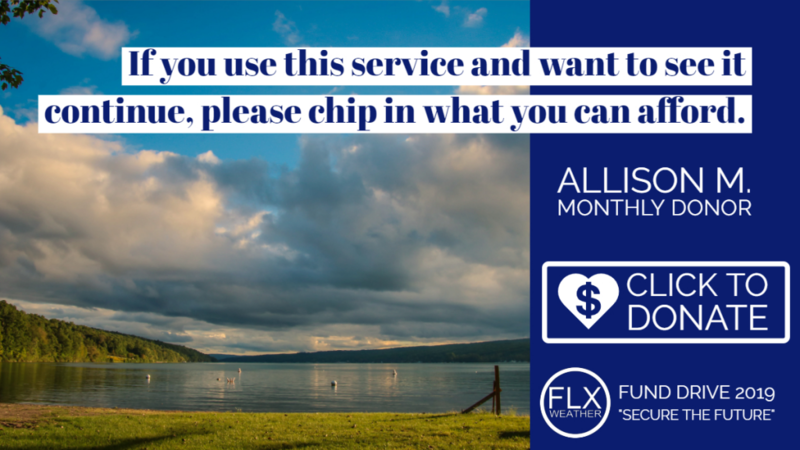 Finger Lakes Weather is viewer supported and relies on monthly contributions to continue. I need about 100 more monthly donors to sign up to fully reach my goals. Many thanks to the dozens who have already contributed — without this support, Finger Lakes Weather would not be able to continue. If you find my services useful and want to see them continue, I invite you to visit my Fund Drive page and thoughtfully consider what you can do to pitch in. Thank you very much for your kindness and support! Hi, Drew. I am confused as to whether I am a contributor to your blog and website. If I am, great! If not, I will immediately sign on. But it would be helpful if I can clarify my status. Any help you can provide is appreciated. Thanks much for your help and services. Terrific!! I really like the blog and it needs to be funded. Thank you! If you have any other questions about the specifics of your donations, let me know!